We are Downieville's longest running bike shop and mountain bike shuttle service in the Sierra Buttes — home to the world famous Downieville Downhill. 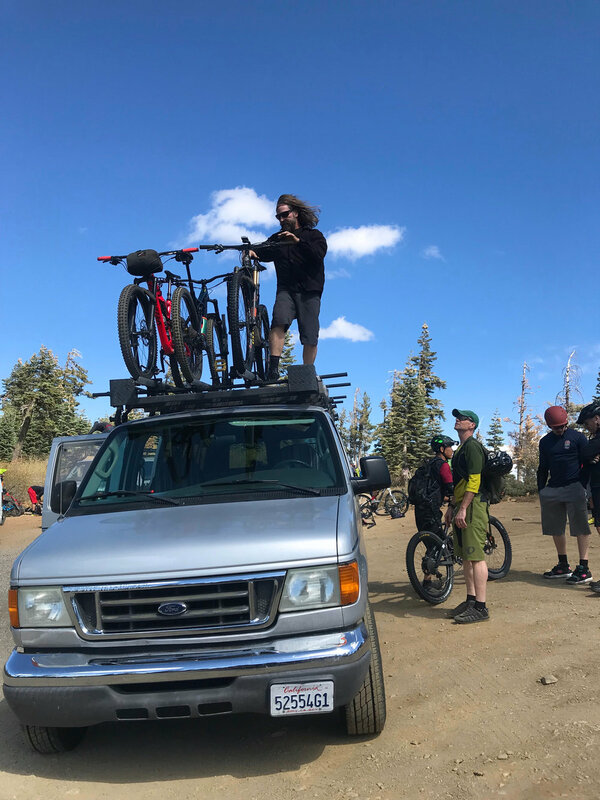 We've been doing this for 23 years, so we know how to get you and your bike safely and comfortably to the top for good times you will always remember. We have 16 rider capacity per shuttle. Phone calls and emails will be returned within 12 hours. In-store reservations can be paid with either a credit card or cash, but are subject to availability. Cancellations within 2 weeks of your reservation date will be subject to a $5 fee per shuttle spot. Each year we offer current models of quality ibis and specialized mountain bikes that come professionally tuned and ready to ride. if needed we also include a helmet, flat pedals, repair kit, plus a map for downhill. As a Dealer we offer the entire LINE OF NEW ibis and SPECIALIZED bicycles. WE ALSO SELL OUR FLEET BIKES AT THE END OF EVERY SEASON. Inquire within!! Downieville Outfitters features mechanic services for all bikeS, PLUS a GREAT retail store featuring components, helmets, armour, and lots of swag. If you require work on your bike prior to a shuttle, YOU MUST notify us beforehand to make arrangements. The Downieville Downhill has a new 1.3 mile trail, the Sunshine Trail which links up with the World Famous Butcher Ranch trail, a 150 year old mining dirt road and then hits the Divide's, which are also old packing trails. There are loops at the top to make your ride longer if you have a cross-country bike (Pauley Creek, Big Boulder and Lavazzola). The downhill is over 14 miles long and offers a two alternate routes in the middle... Third Divide, smooth singletrack strictly downhill or Second Divide, cross-country singletrack. The Downieville Downhill requires strong Intermediate skills to ride it. The Cross-Country alternate routes are also strong Intermediate. The trails are well defined and lush. The Downieville Downhill begins with a 1.3 mile singletrack trail, the Sunrise Trail, crosses the firewood and continues on as the butcher extension trail for another 2 miles. It then links up to Bucher Ranch, a 150 year old trail with the most techinical spots on the downhill. At the bottom you’ll cross Pauley Creek and ascend about a half mile to 3rd Divide for smooth fast single track, ending on upper and lower 1st Divide, which bring you back to town. The ride is Intermediate to Technical depending on how hard you ride. You can make it easier or harder depending on your level of comfort. The trail begins at el. 7100' and ends at el. 2800' over the course of 15 miles, so it is considered a pedalers downhill. There are three loops at the top of the Downhill for Cross-Country riders: Pauley Creek, Big Boulder or Lavazzola Creek.The 2nd Divide Trail is the Cross-Country ride as an alternative to the Downhillers 3rd Divide. Many riders link up a loop at the top with the 2nd Divide trail for a 3-5 hour ride. *” Pauley Creek Trail is the second great downhill ride in the Downieville collection. It shares all the technical joys of Butcher and Big Boulder trails in a setting of great beauty. Its more visual than other area trails because it starts in open country. Traveling to this trail allows you to get a larger picture of this part of the Sierras from ridge tops to meadowlands. Another advantage of using this trail is that it is more private. You’ll see fewer riders on this run. Do you like the idea of momentum roller-coaster riding on fern covered mountainsides? Does the thought of steep, rocky, stair-step descents teetering above icy mountain creeks mean anything to you? If so, you’ll find all that and more on Pauley Creek. * “The International Mountain Bike Association rates Boulder Creek as an “Epic” American. O.K. There’s not a great deal you can add to that. 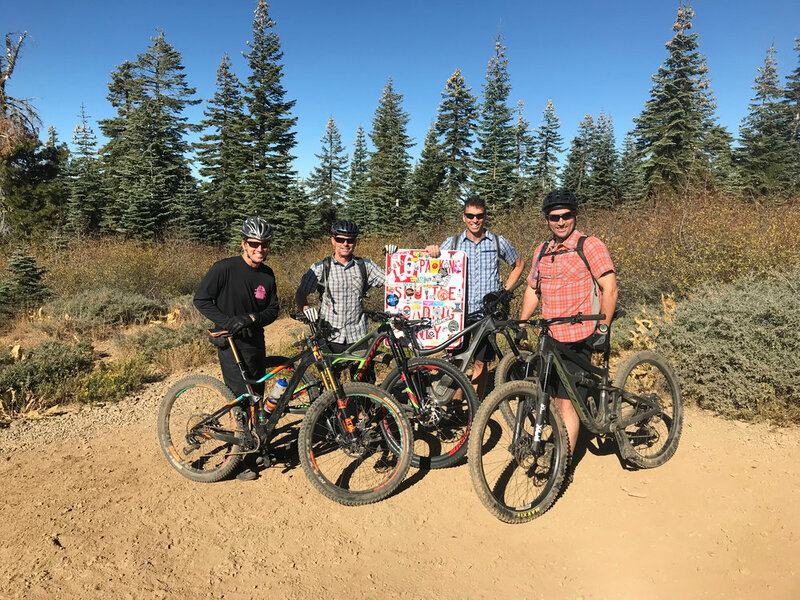 If dropping a stomach churning 1700 feet in 2+ miles on a narrow, rocky trail seems like a good way to relax on your next vacation then yes, you really should consider this ride!” “Most of the Big Boulder Trail consists of rocky, unstable soil conditions. Much of it is extremely narrow, strewn with gnarly tree roots, off camber, and on a steep mountainside. Could it get much better than that?” Long climbs, beautiful vistas, and screamin’ downhill action make this a ride to remember. DID YOU KNOW? 1996 Bike Magazine rated this Empire Creek as the "best downhill in California!" Looking for another downhill in Downieville? Well, here it is and this is a technical one to test your skills! Shuttle takes you up Saddleback Road (8 mi.) up a steep road to Poker Flat and to the base of Bunker Hill where we drop you off. From the trailhead it has a 1 mile moderate climb to reach Chimney Rock, a huge volcanic rock 12 feet in diameter at the base, rising up for 25 feet. At this point you are on a vista with 360-degree views where the trail continues eastward, descenmding under a lightly forested canopy then starts to climb around Needle Point and Rattlesnake Peak until it reaches the end of Empire Creek Canyon where you descend to Downieville. The Mt. Elwell Trail is one of Downieville’s best-kept secrets. It’s a cross-country tour With a variety of elements. It is part sight-seeing trip, part mountain climb, and part downhill thrill ride. In twenty three miles it traverses meadows, ridges, and climbs over 2000 feet. It summits Mt. Elwell, one of the tallest peaks in Sierra County. The 360-degree view from the peak is a breathtaking one. Occasionally from this spot you can see Mt. Lassen, over 100 miles distant. Finally, you descend 3300 feet over eight miles of an assortment of singletrack conditions from buttery smooth to bone-crunching moon rock. It’s a demanding ride that will leave you even more amazed at the variety and challenge of the Downieville area trails. Same beginning as Halls Ranch but make a turn at a fork to do Fiddle Creek. 5 miles west on Hwy 49 to Indian Rock Picnic Area (across from Ramshorn campground). The trail begins just off the access road to the Summer Home Tract. Go 100 ft. up this road and climb 2000' in 2 miles through numerous switchbacks to the ridgetop viewing North Yuba drainage to the South and Fiddle Creek drainage to the North. Immediately climb over another ridge to drop into Little Fiddle Creek before making the final ascent to Halls Ranch. This trail then connects with the Halls Ranch trail. Proceed West on ridgeline to continue on Fiddle Creek ridge trail approximately 6 miles until it descends down to Cal Ida road near Indian Valley Outpost. Beyond Fiddle Creek trail passes through the Indian Burn (result of 10,000 acre burn in 1987) to Hwy 49 Ramshorn. Welcome to Downieville’s ORIGINAL BIKE SHOP! We would personally like to thank all who have made this dream a reality for myself and my family, giving us the opportunity to take a lifestyle and turn it into a successful business. We are excited about our new location and all the options we have to offer to make your experience in downieville the best it can be. In addition to our full service bike shop and shuttles we now have a great restaurant(Sabrina's at the forks), camping store, SUP's and float tubes for rent and sale, outdoor clothing, (including show shoe rentals in the winter) plus an awesome patio to hang out and enjoy a beverage by the river. We look forward to another successful year. Thanks again and hope to see you soon! Shuttle reservations will be confirmed with a credit card. All messages and emails will be returned within 12 hours.